Basketball Game? What Basketball Game? RADOK PARTY ROOM WITH A COURTSIDE VIEW: You can live it up in the Party Suite at Bobcats Arena. Basketball Game, What Basketball Game? The Charlotte Bobcats Arena opened to great fanfare last fall, with a series of events geared to involve the public with the venue. Generally positive response seems to suggest the strategy has worked, as the Queen City masses steadily throng to partake of the arena's concerts and games. 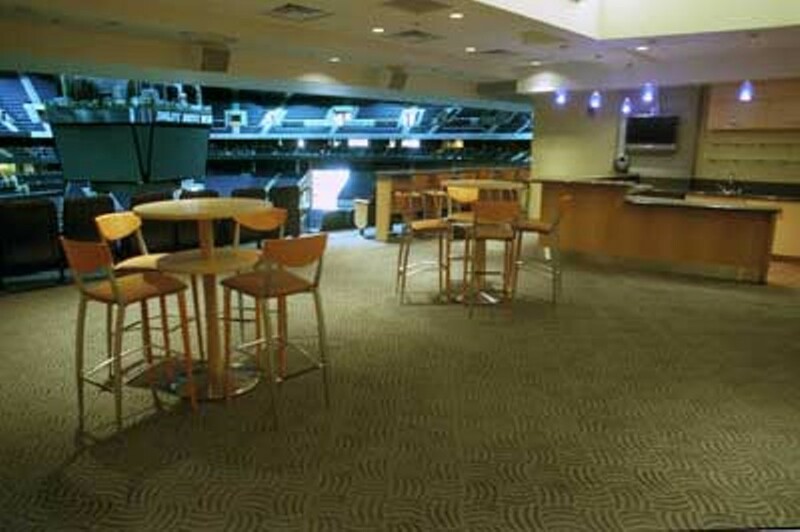 However, despite pains taken to accommodate fans in everything from concessions to more leg room in the rows to bathroom placement, there are still some exclusive areas: the Inner Circle Club seat owners' private lounge, the Back Court (a space that offers a behind-the-scenes perspective, such as the team's arrival and departure from the playing floor) and tiers of royal boxes located up from the arena's central seating bowl. Then there's 333, a 300-seat fine-dining restaurant located at the Founders Level's east side and available only to premium seat holders. Banker or baller (or racer), chedda is what's required for access. But I'm here to tell you about the par-tay suite. An elevator takes you up to the suite level where you're led down a carpeted corridor to an opaque closed door. The suite within is also carpeted and well-appointed, with pub tables, bar stools, plush black-leather stadium seating -- including drink holders, courtesy phone, flat-screen monitors, multi-faceted mood lighting and fine art prints. Most key -- besides the bird's eye vantage point above the court -- is the bar and kitchenette set-up from which dedicated wait staff provide food and beverage service from a predetermined catering menu. (This service comes at an additional cost.) At $95 per ticket, including parking passes and the game or event, this package is meant to satisfy any group's pursuit of hedonism within limits. Depending on group size, the cost varies, but this being the least expensive of the arena's premium offerings means the Party Suites have been quite popular in this debut season. The suite provides seating for up to 50 guests, as well as access to the Founders Level, 333, the club lounges and outdoor terraces (where the cool kids smoke during concerts). There is also the option to collapse the partition door between suites, bringing the capacity to 100. All of the arena's four Party Suites can be hired on a single-event basis, although they are not heavily promoted for rock concerts such as the recent U2 and Bon Jovi shows, when the angle from the pictured box would have been from behind the stage and offered partial visibility. Anyone with sufficient bank can rent these suites, yet one can rightly suppose the possibility to do so would mostly rest with the corporate lot. So here's a hint to the CL poobahs: An "Employee Appreciation Day" shindig during some upcoming concert would most certainly be welcome.